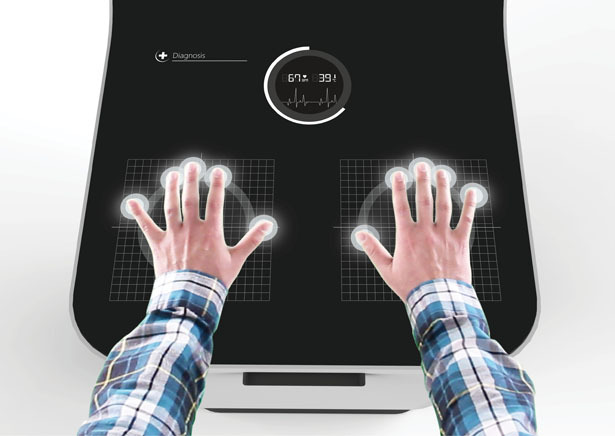 Smart Consulting Service: what else can hands reveal beyond heart rate & temperature? Every year almost 3 billions visitors are welcomed in chinese hospitals. Smart Consulting Service presents an alternative virtual solution in order to improve and optimize the doctors-patients contact. The service e.g. includes an assessment of heart rate and temperature via the hands. What else will the future bring? Smart Consulting Service has been designed to reconcile patients and doctors. The service is located at the hospital’s entrance, it allows people to register and pre-consult themselves before seeing a doctor. Except for providing advice and guidance, the human-sized virtual assistant will guide patients through the pre-consulting process, all the way from there personal informations to there health recommendations. A touchable display, micro and camera’s technology will detect people’s disease and diagnose their vital signs. Once the pre-diagnosis step complete, the service will guide patient to make an appointment with the appropriate or favorite doctor. Smart consulting service will send patient’s health information and first-hand diagnosis to there assigned doctor, therefore making the consulting process more efficient and enjoyable. The video below demonstrates how Smart Consulting Service works in China.